Type B insulin resistance is a rare autoimmune disorder caused by the production of a highly specific autoantibody against the cell surface insulin receptor. A combined immunosuppressive regimen consisting of rituximab, cyclophosphamide, and high-dose steroid pulses, followed with azathioprine maintenance therapy, is a highly effective and relatively safe treatment for patients with type B insulin resistance, according to results published in Diabetes Care. 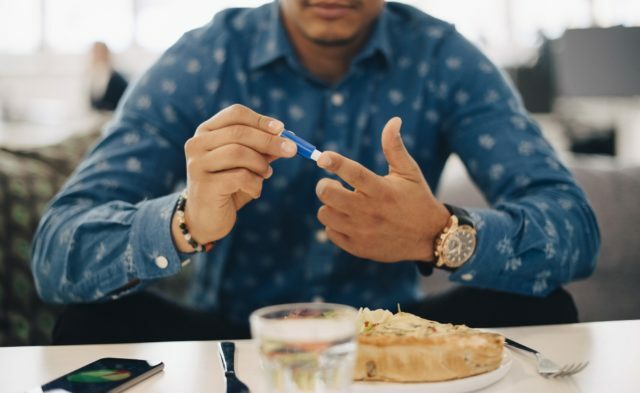 Type B insulin resistance is a very rare autoimmune disorder in which patients experience diabetes that is refractory to massive doses of insulin, severe hypercatabolism, hyperandrogenism, and a high death rate. In this prospective cohort study, 22 patients with type B insulin resistance were treated with rituximab, high-dose pulsed steroids, and cyclophosphamide until remission, deﬁned as the amelioration of the hyperglycemia and discontinuation of insulin and/or normalization of hyperandrogenemia. After remission, patients received maintenance therapy with azathioprine. The efficacy of the combination regimen was compared against a historical control cohort of 29 patients treated with plasmapheresis or single-agent immunosuppression. Combination immunosuppressive therapy was associated with a signiﬁcantly higher remission rate of 86.4% (19 of 22 patients) vs 41.4% (12 of 29 patients; P =.001), which was achieved after a signiﬁcantly shorter treatment duration of 5 (interquartile range, 4-6.3) vs 30 (interquartile range, 10-44) months of single-agent therapy (P =.004). Of importance, treatment with combination therapy resulted in 0% mortality vs 44.8% (13 of 29 patients) mortality in the single-agent control group (P =.0002), monitored for a similar period of time (P =.27). “This treatment has changed the natural history of this disease, from 54% mortality to a curable form of diabetes and should be recommended in this group of patients,” stated the researchers. Klubo-Gwiezdzinska J, Lange M, Cochran E, et al. Combined Immunosuppressive therapy induces remission in patients with severe type b insulin resistance: a prospective cohort study. Diabetes Care. 2018;41:dc180884.